Two female figures, dressed as men and astride galloping horses, have their concentration focused on their game of polo. 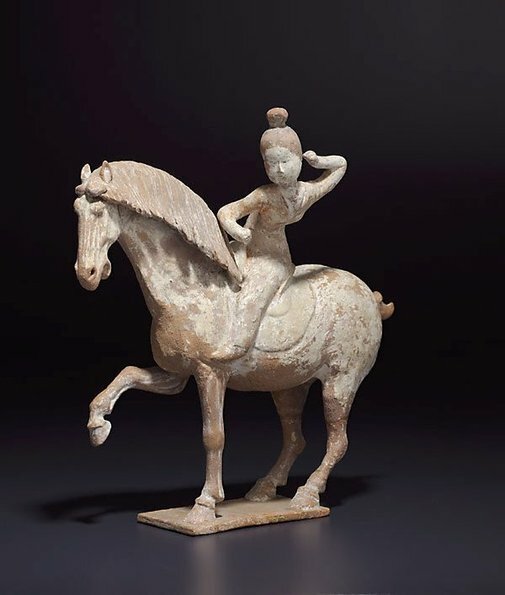 In the repertoire of tomb figures, the activities and poses of women are more limited than those of male figures, so it is refreshing to find figures such as these equestriennes. It was normal for women to dress as men for riding at this time. Polo originated in Turkistan and was popular in Khotan and during the Kai-yuan era (713-42) in China when figures such as these were made. A passage in the "treatise on carriages and dress" of the Jiu Tang shu (Old Tang History) records that "At the beginning of the Kai-yuan period, the palace ladies who rode behind the imperial carriage all wore Central Asian ('hu') hats, exposing their painted faces, without a veil. The families of the multitude of officials followed the fashion and the style of the veiled hat ('weimao') was absolutely out. After a while they also exposed their hair when riding. Some were wearing men's dress and boots. Highborn and lowborn, men and women, could not be distinguished from one another, all looked alike" (I. L. Legeza, 'A Descriptive and Illustrated Catalogue of the Malcolm MacDonald Collection of Chinese Ceramics', London, Oxford University Press, 1972, p5). These pieces (now considerably restored) originally would have been decorated with unfired pigments. Jackie Menzies, 'Early Chinese Art', AGNSW, 1983. cat. no. XXV. Early Chinese Art , Sydney, 1983, not paginated. cat.no. XXV. See 'Further Information' for text. The Asian Collections Art Gallery of New South Wales , 'Tomb Sculpture', Sydney, 2003, 85 (colour illus. ).